Chanson Water USA is a division of Chanson Water Co. With a staff of over 400 and 19 production lines at our ISO 9001:2000 certified factories, we can produce over 200,000 units every month. 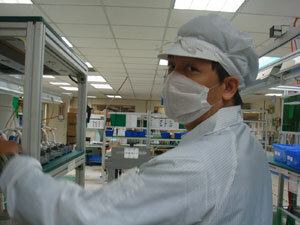 We conform to CE, UL, CSA, ISO, NSF, WQA, RoHS, Special Patents and Quality Report to meet worldwide market regulations. We have 14 warehouses, three factories and two R & D (research and development) centers in Taiwan which contain laboratories with ultra-modern testing equipment. Water ionizers are produced in the Kaoshiung factory (2,000 square meters), water filters are assembled in the Taichung factory (3,200 square meters), and small samples are produced in the Taipei county factory (1,200 square meters). Our 60 R &D specialists help us to release innovative new products each year, and were the first in the industry to develop 262K color LCD ionizer screens, in-mold decoration panel design, and electronic faucets. In addition, Chanson offers the longest lasting and most compact ionizers in the world and use the least amount of power. individual persons shared under their 1st amendment right of free speech. The information on this website has not been reviewed by the FDA. Products offered for sale herein are not intended to treat, cure or prevent any disease or health condition. No medical claims are being made. Click here to see why we must say that.